As teachers, we know how difficult it can be for students to learn how to add and subtract fractions with unlike denominators. 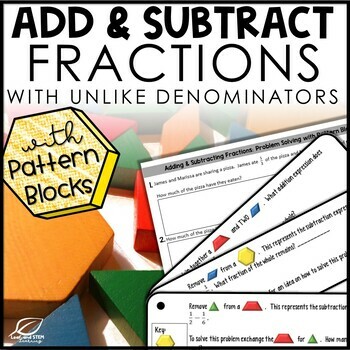 Use this introductory lesson and pattern blocks manipulatives to help students gain confidence! This lesson includes a set of guided task cards to use to introduce the manipulative. Then, with word problems that have been carefully composed to work with this manipulative and mat, you can teach addition and subtraction in real-world context. 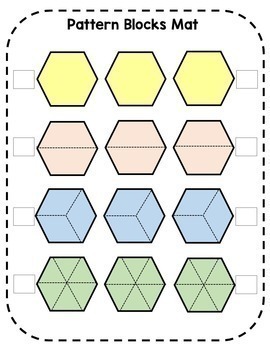 Also included are twelve computation problems that work with the pattern block manipulatives. 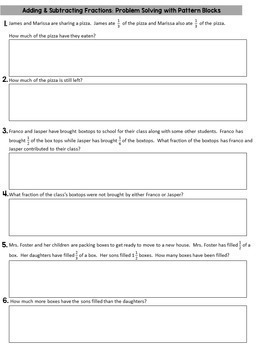 A teacher guide and answer key are included to help you get set up and save time. Huge Revision!! 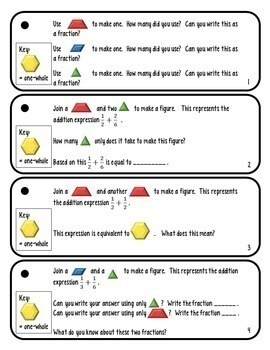 If you have looked at this resource before, it now includes task cards, 6 additional problem solving and computation questions, improved teacher guide, and an answer key. ★Texas Teachers Bundles★ Save 20% to 30%! This item is also bound by copyright laws and redistributing, editing, selling, or posting this item (or any part thereof) on the Internet are all strictly prohibited without first gaining permission from the author. Violations are subject to the penalties of the Digital Millennium Copyright Act.